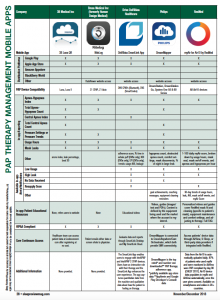 Compare 5 positive airway pressure therapy (PAP or CPAP) management mobile apps side by side. Click on the thumbnail above or “1118MobileApps” to view the full matrix at a legible size, download it, or print it. Sleep Review‘s matrix compares features such as distribution platform (Google Play, Apple App Store, Amazon Appstore, Blackberry World), compatible PAP devices, in-app reporting (AHI, total apnea-hypopnea count, central apnea index, total central apnea count, pressure settings/trends, usage hours, mask leaks), in-app alerts notifications (low usage, high leak, no data received, resupply soon), educational resources, HIPAA compliance, and care continuum access. The apps compared are 3B Medical Inc 3B Luna QR, Breas Medical NiteLog, Drive Devilbiss Healthcare DeVilbiss SmartLink App, Philips Respironics DreamMapper, and myAir for Air10 by ResMed. A version of this comparison guide is published in the November/December 2018 print issue. If your company is missing, please e-mail sroy[at]medqor.com so you can be considered for the next update. Information for this guide based on data submitted by device manufacturers. Sleep Review strives for accuracy in all data but cannot be held responsible for claims made by manufacturers. All apps may not be included. Email sroy[at]medqor.com to be considered for the next update.